If we want to talk about the King of Clubs, we must first look at the nature of his empire. Traditionally, ‘clubs’ have represented fraternities, associations and co-operation. They herald the art of negotiating, and the power of networking and syndicating. The King of Clubs is no exception. During his rise to power the good king was keen enough to buy out the competing means of production, and as it turns out, this would pay huge dividends in the long run. These days, in the world of cards, the King of Clubs is the guy who owns the night clubs, the comedy clubs, and the country clubs. He owns it all, and he loves to show it all off as much as possible. If you don’t believe me, pick up a pack of cards and look at the crown resting on the head of any of the kings. Chances are there will be a club symbol present in the design—this is by design. The patterns and symbols found throughout an entire deck of playing cards are an intricate masterpiece, with symbols and colors appearing in many different places. (For example, diamonds are sometimes found on the robe of the King of Clubs), but no symbol is more represented by than the clubs. On nearly every deck of cards his trademark can be found adorned on the heads of the other kings as a silent reminder as to who the money is. Under the English system, the King of Clubs is usually featured holding a sword, and in the other hand there is a jeweled orb floating mysteriously in front of him. Under the French system, the King of Clubs sports a scepter that has a glowing orb surmounted on top. Having a scepter of any material is fairly pimpin’ in itself. 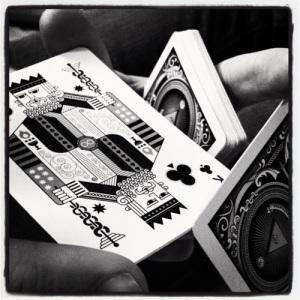 However, not wanting to be outdone by the mysticism of the King of Diamonds, the King of Clubs made the decision to pay sizeable amounts of money to the French card makers to have his hand that used to be holding the orb removed so as to give the king himself an air of mystery to his appearance. Regardless of the country, no one knows exactly what is in that mysterious orb, but some make the claim that it contains the king’s personal supply of Hennessey. Nowadays, the King of Clubs can be found relaxing at any number of his beachfront properties with his exotic wives—pick a number! In a recent E! True Hollywood story, the king opened the doors to his private life over the past ten years, and his story detailed a life of booze, drugs, and international arms manufacturing. In particular, his special “Ace” brand bullets. While he does not say it outright, the King of Clubs seems to hint at a truth to the much disputed claim he was ultimately behind the unconventional “upside down” hanging of The Joker.